The Andex 1254 and Andex 1304 by Vicon are designed to make lighter work of tough conditions and boosts raking capacity with a 12.5m working width. They master high capacity and easy operation by focussing on the elements that really matter. Working width can be adjusted hydraulically between 10.0-12.5m, and transport height is well below 4.0m, even with tine arms mounted. The Andex 1254 and 1304 (Pro) give no reason for wasting time, not even when moving between fields. Just raise the rotors and off you go, securely below 4m transport height. There is no need to leave the tractor to remove tines arms. Large transport wheels and hydraulic brakes are standard. 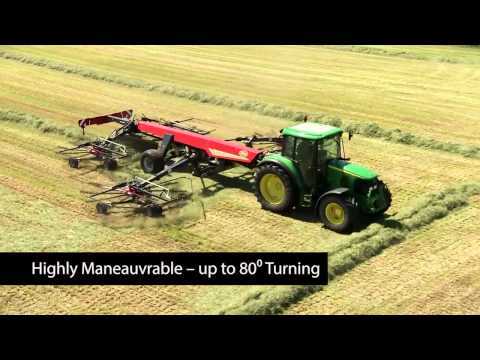 The Vicon rake models Andex 1254 and 1304 (Pro) come with enhanced headland management. In addition to high ground clearance of rotors during headland turns it is possible to tailor time delay between lifting/lowering the front and rear rotors to driving speed and field conditions. This is done mechanically in an easy and uncomplicated way. The Andex 1254 will do sharp turns of up to 80⁰, both on headlands and during transport when passing narrow gate ways. The rotors can, as a standard feature, lift pairwise which is convenient for raking crop away from fence lines or when raking low crop fields.